Generally inline skates are categorized as recreation, fitness/performance and specialized/sport. The majority of our students begin skating on recreational or fitness style skates. While there are many technical components to consider; such as, boot shell type, wheel size, wheel hardness, and bearing speed, we recommend beginning on recreational or entry level fitness skates at a price range of $125 to $250 for adults, $60 to $80 for children. The saying, “you get what you pay for”, applies to any inline skate purchase. Skates below the price point of $125 are generally uncomfortable, under-performing and lack functionality to support your investment in inline skate lessons or most inline skate ventures. Too inexpensive skates can facilitate a bad first experience on inline skates leaving you with an impaired first impression of the sport we have come to love. Come to think of it, inline skating without professional inline lessons can lead to a bad first inline skate experience and impaired vision of inline skating, but I digress. Conversely, purchasing inline skates at a higher price point can outperform the new or untrained skater. However, the more money you spend, the more comfort and performance you receive. In sum, stay within the aforementioned price range and you will be set up for success. Robichon’s reserves the right to refuse skate lessons to participants using poorly performing skates. Skating outside is different than skating indoors. Therefore, in any context, we recommend Robichon’s professional Outdoor Skate Basics lessons to go with your new or upgraded inline skates; especially for beginners. We have skates ranging from children size 10 to adult 15. If you would like a try before you buy, you can rent before you purchase. A main benefit of renting skates is you receive equipment wisdom from professional skate instructors and can decide if you enjoy the sport of inline skating before you purchase. If you would like to learn if this sport is for you, or more about quality skates, we recommend the rent first, buy later option. When you decide to purchase, find a quality retail shop. A quality retail shop is a store where the staff are knowledgeable about the equipment they sell. Online retailers often offer excellent prices, however, we recommend you know what skate you want before you purchase any skate online. Wheels are measured by two features: hardness and size. Wheel sizes range from 74 to 125 millimeters in diameter. Some sport specific, children and recreational skates are equipped with smaller diameter wheels. Other sport specific and performance skaters are equipped with larger diameter wheels; such as, speed skaters. Smaller wheels roll slower while larger wheels roll faster. We recommend beginning skaters start out on skates with 76 to 80 millimeter wheels. 84 millimeters and up are more suited for more advanced skaters. In general 80 to 84 millimeter wheels are adequate for recreational and fitness skaters. Wheel durometer refers to the wheel hardness. A skate wheels durometer range is generally 78A to 82A. 78A is softer while 82A is harder. The rating is located on the side of the wheel and is indicated by the letter A. Softer wheels wear more quickly, but are better at absorbing rough skating surfaces. Harder wheels roll faster and last longer, but are less equipped to absorb rough skating surfaces. When beginning, we recommend a middle of the road approach. Like bicycle wheel bearings, bearings in inline skate wheels allow the skate to roll. The precision of bearing development is a main factor used to identify the quality of a bearing. Skate manufacturers generally use an ABEC rating system to identify bearing quality. In recreation to performance style skates, the most common bearing rating is the ABEC rating system which currently range from ABEC 1 to ABEC 7. The higher numbers equal a greater quality bearing (or precision) while the lower numbers equal a lesser quality (or degree of precision). Generally skates designed for recreation skaters will have lower ABEC rated bearings than skates designed for performance skaters. Ultimately, if you purchase a $150 recreation skate, the ABEC bearing rating will correspond with lower ABEC (slower rolling) bearings. Many recreation skate bearings come packed with grease. As you begin to develop confidence and skating proficiency, you can replace grease packed bearings with oil or gel. Refer to our skate maintenance class. We require all new skaters wear a helmet and protective equipment consisting of wrist guards, elbow and knee pads. We rent quality protective gear to get you started or you can purchase equipment at your local retail store. While we require protective gear use in all of our beginning courses; ultimately, it is your choice to use or not use while skating on your own. Although taking lessons from qualified professionals reduces the likelihood of falling, accidents do occur while inline skating. Wearing protective gear can eliminate or reduce the likelihood and severity of injuries. We will always recommend the use of protective gear. Type of protective gear differs with skating type. For helmet-fitting guidance, please refer to Children’s Hospital Los Angeles. Learning to skate from a local professional instructor is perhaps the most important piece of protective equipment you can invest in. 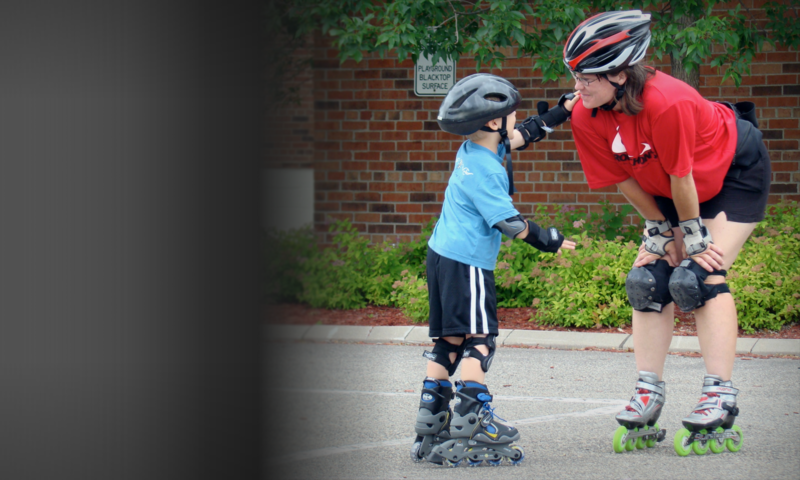 Nothing can replace learning to drive your new inline skates from a knowledgeable local inline skate instructor. The second most important piece of equipment is a quality helmet. You should always wear a quality (See SNELL ratings) properly-fitted helmet. Inline skate helmets are bicycle helmets. In general, standardized bicycle helmets are adequate for inline skating. Speak with your local knowledgeable bike store staff for an adequate helmet. Wrist guards help protect your wrists when falling. Most skaters use their hands to protect themselves from a fall. Wrist guards are designed with a plastic part to help absorb any fall. Robichon’s discusses how to use the wrist guards in addition to preventing falls altogether. That said, falls do occur and wrist guards are highly recommend. Knee and elbow pads. Both knee and elbow pads also have hard plastic that allows the skater to slide to a stop. The sliding helps prevent skin abrasions. Crash pads. While we teach steps to prevent backwards falling, in the event of an unexpected backward fall, you may consider purchasing crash pads which have padding which protects the coccyx (tail) bone. Accidents can and do happen while inline skating. The best way to reduce your risk for injury is by taking professional inline skate lessons, wearing protective equipment, knowing your ability level, skating within your ability level, and maintaining your equipment.